The Enrichment Daycare Center at 21 Yennicock Avenue is available to children 3 – 5 years of age. Our hours are 7:30 AM – 6:00 PM daily – late stay until 6:30 available for an additional fee. We are open year-round, with holiday closures noted under “Enrichment” on our calendar. We’ve developed a curriculum designed to meet the specific needs and developmental stage of this age group. Our goal is to provide parents with a warm, safe and caring environment where their child can grow, thrive and have fun while learning. Each child is an active participant in his or her own learning in a safe and nurturing environment. 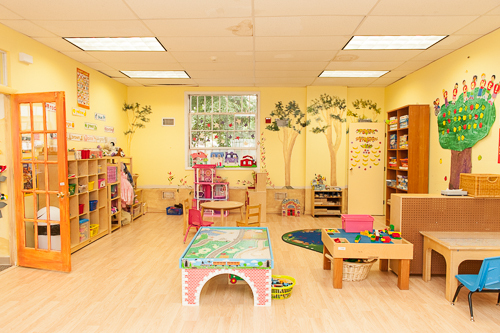 The preschool environment consists of a multitude of learning centers designed for dramatic play, manipulative and game play, creative arts, block building, music and movement, science and discovery, a cozy corner for reading and relaxation, a multi-purpose room for games and play and an outdoor garden, gym and playground for large muscle development. Learning occurs as children are encouraged to move freely and independently making individual choices and exploring. Children have the opportunity to build peer relationships and develop social and emotional confidence as they learn and develop respect for others. Cognitive components of the curriculum include, mathematics, science, social studies, language arts, creative arts and music and movement. Our qualified staff and certified teachers provide a safe, nurturing and healthy environment where each child can thrive and learn at their own pace. Our warm teacher-child relationships create an environment which fosters curiosity, encourages exploration and stimulates patterns of learning. Our program is designed to encourage social, emotional, physical and intellectual growth through a curriculum designed to meet each child’s individual needs and interests. Through small group and large group activities children develop self-esteem and essential life skills through varied activities including; art, music, movement, storytelling, language arts, cultural exploration, science, math, block building and manipulatives, imaginary play, and much more! In our program the emphasis is on creative expression and exploration through hands-on, child centered activities. Children may also enroll in our Enrichment Classes to further enhance their learning. Weather permitting, the children play outside daily on climbing equipment and ride their bikes in the bike area. The children participate in planting and digging days as they play, work and explore nature in our outdoor garden. An outdoor snack is often enjoyed on our picnic tables in the nice weather. Music and movement exploration and sports and fitness are lots of fun for everyone in our indoor gym. Each term we offer a variety of classes. Learn more on our Enrichment Classes page.